Every year about this time we get many calls about needles turning brown and shedding on various species of Pine trees. Needle drop is a natural occurring plant cycle and should not cause alarm. This is mainly an issue for white pine and Scotch pine. You will also notice it on Red Pine and Austrian Pine. Periods of drought will cause pines to shed more than normal and we are seeing that with the unusually dry year we have experienced. 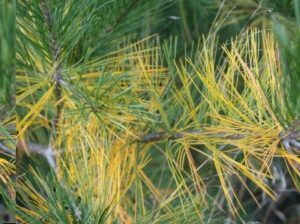 Typically, pines will hold only one to two years of needles and they will turn brown and drop in the fall.